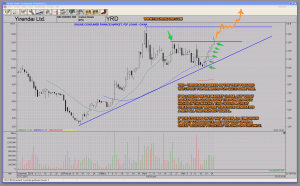 The online consumer finance stock YRD – Yirendai has long been part of the ‘Focused Watch List’ available for Premium Members. Although the market is not closed yet, it looks like YRD – Yirendai will take out the former pivot high created around a month ago. This represents a great technical ‘cheater buying opportunity’. Technically speaking, it is a very interesting place to buy the stock. It is buying into strength after patiently waiting for the stock to confirm solid accumulation. On the other hand, it is anticipating a run to its all time high. Printing new all time highs will trigger a lot of technical buy orders. This cheater entry allows traders to position themselves just before the ‘all time high momentum traders’ rush into the stock. 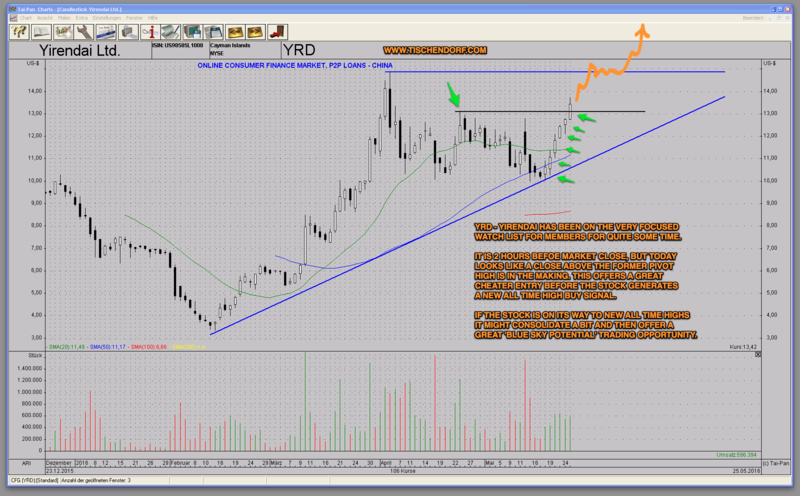 If YRD – Yirendai is on its way toward new all time highs it might consolidate a bit around the 15$ mark. Then the bullish ascending triangle in blue will provide excellent pattern pressure for a continued run to the upside. We are not there yet, but if the stock continues to be accumulated, odds are high it will power higher. Technically speaking there will be no overhead resistance and YRD will offer ‘Blue Sky Potential’. Yirendai Ltd. operates as an online consumer finance marketplace that connects borrowers and investors primarily in the Peoples Republic of China. It offers standard, fasttrack, and vertical loan products. The company also provides credit scoring and fraud detection systems, and investing tools. The company was founded in 2012 and is based in Beijing, the Peoples Republic of China. Yirendai Ltd. is a subsidiary of CreditEase Holdings (Cayman) Limited.